This report describes how intermediate care beds are being provided in Scotland. It also looks at the benefits of high quality bed-based intermediate care as part of integrated health and social care services. 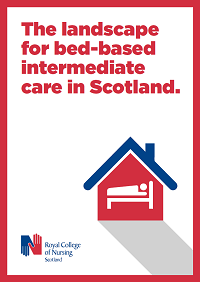 This report explores how intermediate care beds are being provided in Scotland today. It looks at the evidence that shows what works well for intermediate care, and identifies a gap between the Scottish Government’s vision and how intermediate care beds are being provided across Scotland. Alongside the report, RCN Scotland has produced a Tool to support nursing leaders making decisions about bed-based intermediate care. Nursing staff are involved in commissioning, planning and delivery of bed-based intermediate care services, and this tool can help those staff think through what needs to be considered.